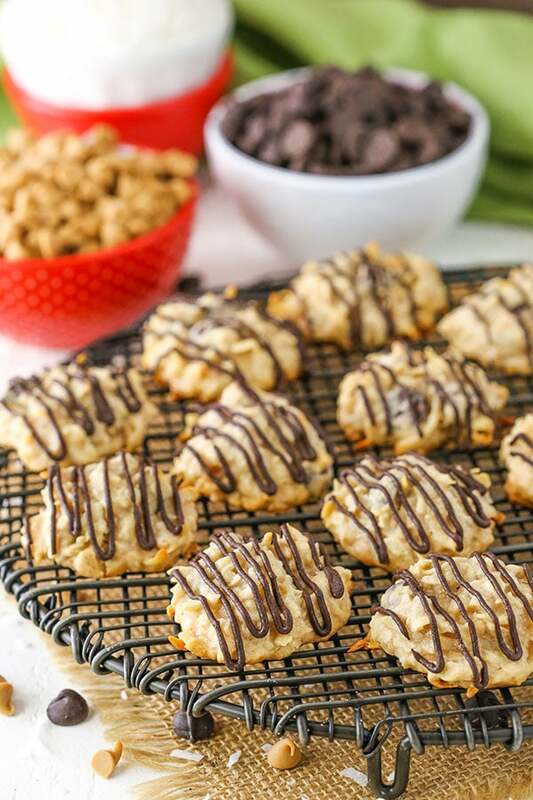 These Peanut Butter Chocolate Chip Macaroons are easy to make and super chewy! They are full of peanut butter and chocolate and perfect for your cookie tray this holiday! This post is sponsored by ALDI, but all opinions are my own. Who doesn’t love a good cookie this time of year? It’s easily the time of year for cookies with all the parties and cookie exchanges. I never fail to meet some new kind of cookie at least once this time of year and trying them all is so fun. But I’m also a fan of the classics – the cookies you can make year round and the ones you make over and over again. You know, the ones that are so good that you must make them any chance you get. 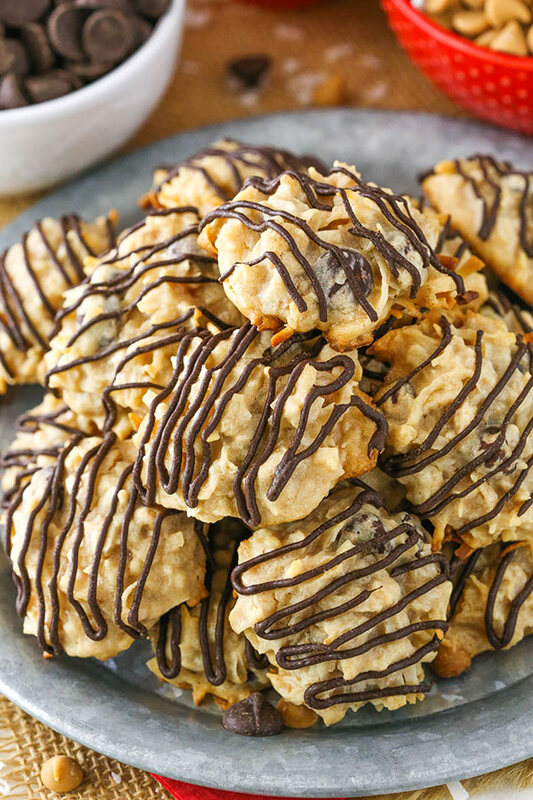 These macaroons are totally that kind of cookie. Perfect for a cookie tray and perfect for making over and over. If you’ve never made a macaroon, then let me let you in on a little secret. They are the easiest cookie to make ever! They are the cookie world’s gift to people without a ton of time. So not only are these totally worth making simply because they are so yummy, but they are so easy there’s really no reason not to make them. Plus, ALDI makes holiday shopping easy this time of year. Their stores are made to get you in and out of the store without a ton of aisles full of overwhelming options, while still having what you need at affordable prices. And since these cookies only use about seven ingredients, they are even less expensive to make. Not to mention that while you’re at ALDI, you can grab a delicious bottle of wine. Who doesn’t need a little libation this time of year? And their wines are seriously awesome and at great prices too. I personally love all of the Moiselle wines. Stock up! Wine and cookies? Don’t mind if I do! So let’s talk a bit about these cookies. 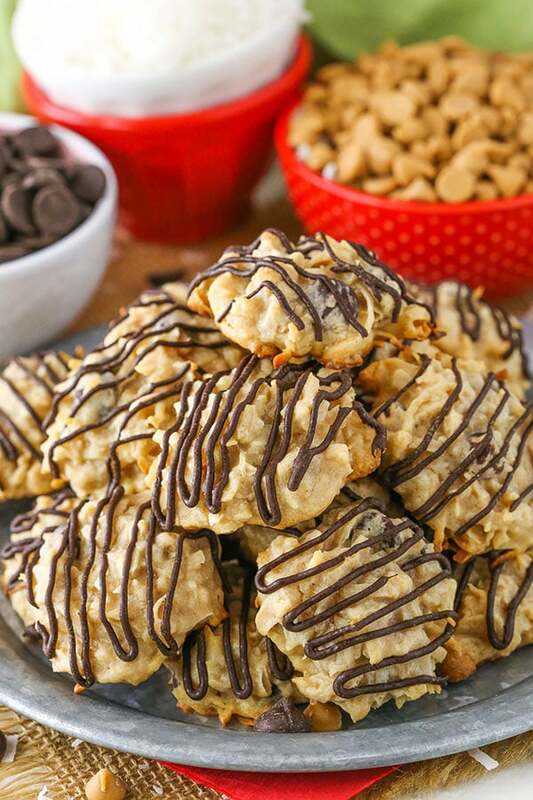 The main players in macaroons are the shredded coconut, sweetened condensed milk and egg whites. 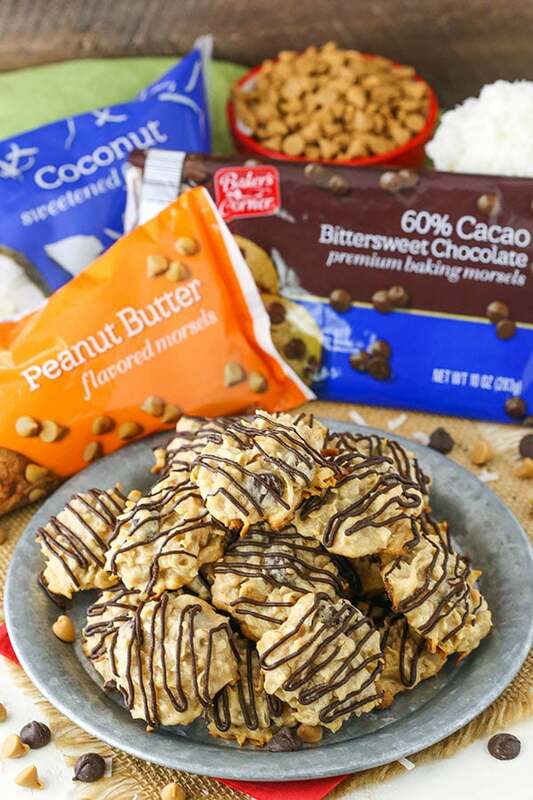 To these particular cookies, we also add peanut butter, dark chocolate chips and peanut butter chips. ALL the good stuff! Everything but the egg whites and salt are combined, then the egg whites and salt are whipped to stiff peaks and added to the mixture. Once the cookies are baked, I love to add a little drizzle of chocolate. I used some chocolate almond bark, but you could also use some of the remaining dark chocolate chips. I just find the almond bark is sometimes easier to work with for melting and can also be found at ALDI – score! The final macaroons are soft, chewy and full of coconut, peanut butter, and chocolate! They were a huge hit with everyone when the hubs took them to work, so there’s no doubt they’d be great for your holiday crowd! To find an ALDI store near you, use the locator included on their site. 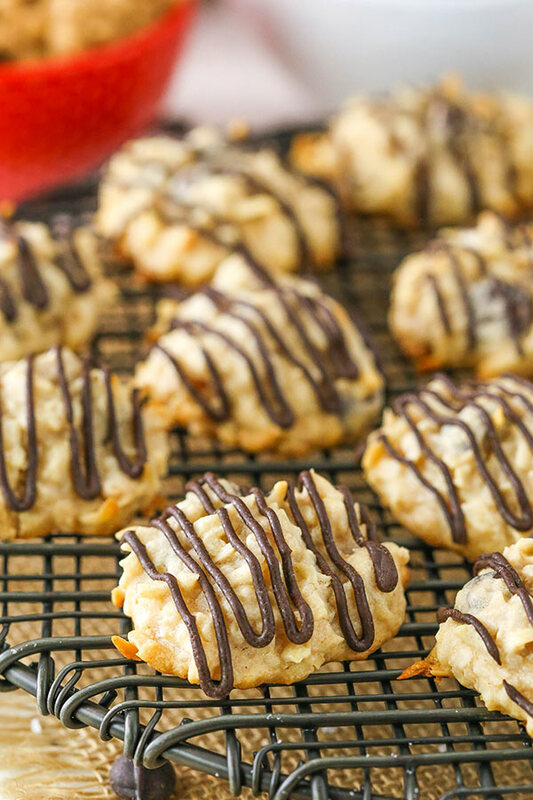 Peanut Butter Chocolate Chip Macaroons are such an easy dessert! 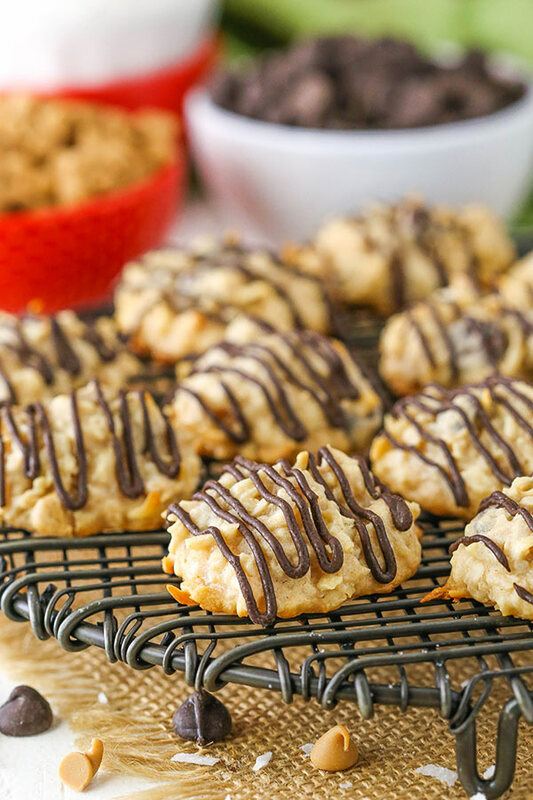 Full of peanut butter & chocolate, they’re perfect for your cookie tray this holiday! 1. Preheat the oven to 325°F (163°C). 2. Combine the coconut, sweetened condensed milk, peanut butter, chocolate chips, peanut butter chips and vanilla extract in a large bowl. Set aside. 3. Add the egg whites and salt to a large mixer bowl and whip on high speed with the whisk attachment until they reach stiff peaks. 4. Carefully fold the egg whites into the coconut mixture. The coconut mixture will be fairly thick, so be patient as you gently work the egg whites into the mixture. 5. Drop rounded tablespoons of the coconut mixture onto a cookie sheet lined with parchment paper or a silicone baking mat. 6. Bake for 18-20 minutes, until lightly brown around the edges. Allow to cool. 7. Melt the chocolate almond bark according to the instructions on the package. 8. 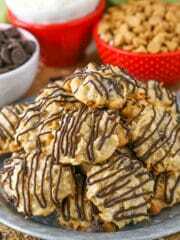 Drizzle the melted chocolate over the tops of the cookies and allow to dry completely. 9. Store in an airtight container at room temperature. 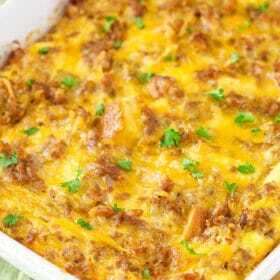 I made this recipe and it was so tasty. Will have to add these to my growing list for Christmas trays! 🙂 I made your butter pecan cookies last weekend – Delicious! 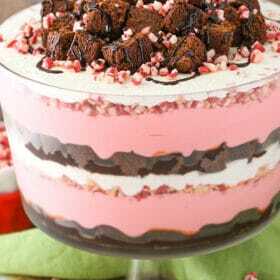 Planning on the peppermint brownie trifle for one of our Christmas dinners. I’m glad you’re feeling good – I look forward to hearing about the twins! What a great recipe! These macaroons look super delicious! Can’t wait to try them myself. Thanks! Lindsey; I get up early every morning just to read your recipes/ blog while enjoying my coffee, and it’s the best part of my day! I’ve begun baking since “retiring”, and I’m SO thankful I found your website! I’ve baked some of the grandest creations for office gatherings, church dinners, and even strangers’ requests! Every one was a success despite my inexperience! I’m learning so much from your tutorials and comments on each recipe. Thank you so much! Best wishes for your continued success and heartiest congratulations on twins!! So where does the peanut chocolate chips come into play? They get mixed in along with the peanut butter and chocolate chips.